It’s 5 a.m., and while most Pitt students are still hitting snooze and sleeping off late-night study binges or a night out, one group on campus is already wide awake and on their way out of the city to start their day. The sun rises over the passing scenery and empty roads as sticks and pads clatter in the back of a cargo van while the Pitt women’s club hockey team travels to Shady Side Academy in Fox Chapel for practice. Since there is only one indoor ice rink within city limits — PPG Paints Arena — the team has to travel elsewhere. “I always have my naps planned on Tuesdays and Thursdays,” senior marketing major and defender Rose Saleh said. The young squad — now in its second season on the ice — is already making an impact on campus and nationally. In the latest polls, the team ranks eighth in the Eastern region of the American Club Hockey Association Division II standings and is preparing for playoffs this weekend. The team — founded in 2016 by junior neuroscience major and forward Dana Julian — is also a member of College Hockey East, facing off against other club teams at schools like Buffalo, Delaware and Mercyhurst. Julian, who played hockey for most of her young life in her home state of New Jersey, came to Pitt for the academics but couldn’t compromise her lifelong love for the sport. “I wanted to come to Pitt for the neuroscience program, but I wasn’t cool with not playing hockey,” she said. It wasn’t an easy start for the team. As a club organization beginning with little support, money was limited. Exceptional fundraising efforts throughout the year are a requirement for the team to stay afloat. “Because there aren’t as many girls who play hockey, we need to keep it as accessible as possible, which means keeping our tuition low to play,” senior electrical engineering major and forward Bre Doherty said. With a fundraising goal of around $8,000 every year, the team has gotten creative — from dinner fundraisers, to letter-writing campaigns, to auctioning off signed Penguins jerseys and selling late-night snacks to passersby in Central Oakland. “We take advantage of any opportunity we can get,” Doherty said. Being a new club sport is difficult to begin with, but being a women’s hockey team can also come with other unexpected disadvantages. 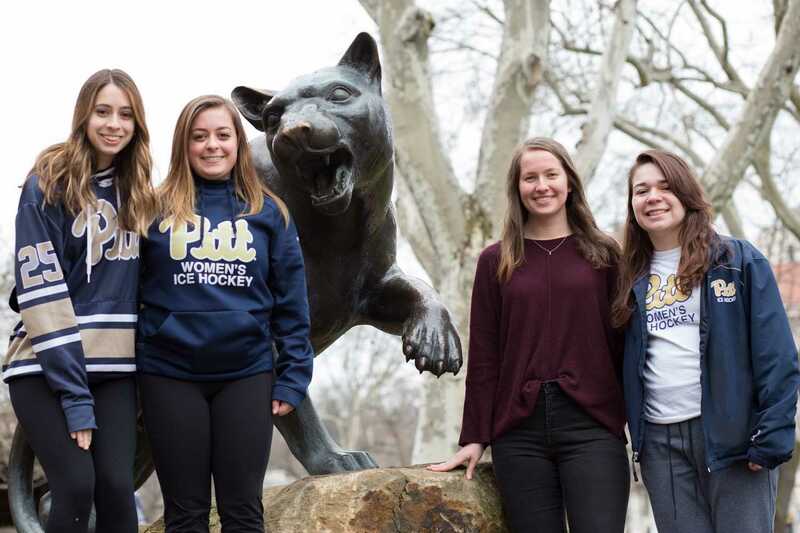 The National Federation of State High School Associations reports that only 26 percent of high school ice hockey players are female, and while many of Pitt’s squad participated on girls high school teams, some had to find other leagues or clubs in their local areas. In some cases, like Julian’s, a boys team was one of the only options available to get on the ice. There was a similar sentiment at Pitt before the team was established. At an activities fair early in her college career, Saleh approached a table of girls representing Pitt club hockey, excited to see a women’s squad. Doherty shared a similar experience. “One time, someone saw my hockey jacket and asked, ‘do you work for the men’s team?’” she said. The team’s coach, Pitt alum Jim Napoli, sees value in furthering the sport of women’s hockey, especially in the Pittsburgh area. He joined the Panthers in 2017, after his youngest daughter — whom he coached throughout high school — saw that the team was seeking leadership and encouraged him to apply. On a national level, women’s hockey continues to grow. The National Women’s Hockey League was started in 2015 and, though it only has four teams nationally, continues to be a voice for female players. Still, there are few professional role models for female players. The girls on the team at Pitt serve as role models themselves, though. When a junior team from Dallas came to the City for a tournament last year, members of the Pitt team went to see them play and gave the girls tours of campus. When the team isn’t practicing in the early hours of the morning, travelling for games or selling baked goods on the street, they still consider themselves a tight-knit crew. “One weekend, we didn’t have a game, no one was having anything at their house, we didn’t have to do anything, and I was like ‘what am I supposed to do with all of this time?’” first-year biology major and forward Shannon McCafferty said. When Pitt student Alina Sheykhet was found dead in her Oakland residence last October, the team rallied around senior center and captain Marissa Oakley, who was roommates and friends with Sheykhet. They also put on a charity game in February to raise money for Sheykhet’s family, and though they fell 2-0 to Mercyhurst, the team raised more than $500. As a part of the National Eating Disorders Association’s National Eating Disorders Awareness Week — which runs from Feb. 26 to Mar. 4 — the team wore purple, green and blue to a recent practice to honor a teammate who is on the path to recovery from disordered eating. And though many of the team members don’t have professional hockey aspirations beyond their careers at Pitt, they do all have one goal — to see women’s hockey continue to thrive. “We just want to see women’s hockey grow in Pittsburgh, and we’ve been reaching out and just trying to make that happen,” Doherty said.